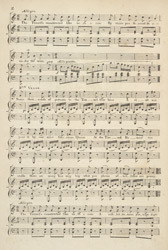 Music often reflects the achievements of society at the time that it was produced, and this song celebrates Marc Brunel's tunnel under the Thames, from Rotherhithe to Wapping. Work began on the tunnel in 1825 but it was not until 1843 that it was completed and ceremonially opened by Queen Victoria. Gas lighting was installed as well as a ventilation system and a bazaar was even set up on stalls in the tunnel itself. The illustration advertises the tunnels use by finely dressed men, women and children however in reality it quickly became unpopular with the public due to the dark and dank conditions.